We always try to take an interactive approach with your design as to combine your ideas with our experience to give you the best possible solution. *Hunter Douglas Authorized Dealer* Designed specifically for you and your family's needs, our closets provide creative, customized and refined solutions for easy everyday living. Top quality brands and house-made custom storage solutions mean less time searching and sorting, and more time living your life. No matter how big or small the space, we can maximize it. Our organization experts work with you to design a layout suited to your specific needs with a broad selection of quality hardware and accessories, and extensive options for colours and finishes to compliment your decor. We offer thoughtful details like handy drawers for the craft room, cubbies with shoe storage for the mud room, or tilt out ironing boards and hampers for your laundry. Enhance your closets and storage space even further with smart accents like belt racks, tie racks, valet rods, LED lighted, hanging rods, and more. 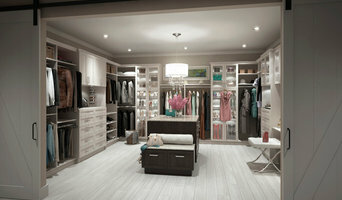 At Stor-More, we proudly create closets that offer modern style and organized efficiency in equal measure. Our customers love the fact that we handle everything from design and inhouse construction on our state of the art machinery, to final installation. You won't have to worry about a thing. Tina Moizer Designs for Interior Design has built a reputation for creating unique interior spaces designed to complement the lifestyle and tastes of her clients. As a certified professional Home Stager, Tina has also assisted many of her clients in selling their homes. Professional UK Interior Designer Tina Moizer now lives in Maple Bay, Duncan, in the beautiful Cowichan Valley on Southern Vancouver Island, BC, Canada. Tina originally trained in the 90’s at the Ivy House Interior Design School, in Bath, England and has continuously updated her training and kept apprised of all of the recent trends and products. Call today to get started! STOR-X® Organizing Systems is a local, B.C. company, now in its 26th year of business. We design custom storage solutions for any space in your home requiring optimization of use through a unique, non-intimidating, buying process. Be it a simple redo of an existing closet, or as a part of a new construction, we offer innovative, elegant solutions tailored to suit most budgets. Applications include Walk-In closets, Reach-In closets, Pantry, Mudroom, Hallway / Linen closets, Garages, Home Based Offices, Custom Libraries, and Wall Beds. Members of the Greater Vancouver Home Builder's Association; we have an A+ rating with the Better Business Bureau and have served thousands of clients over the past 26 years. STOR-X® Organizing Systems are manufactured in Richmond, B.C. and are available throughout Canada and the U.S. All our installed products come with a Lifetime Warranty. Are you in search of your perfect custom closet provider in the Langley or Maple Ridge area? Search no further; STOR-X® has been proudly serving homeowners for over 25 years, and we have great ideas for all your storage and custom closet needs! Our Langley/Maple Ridge consultants are highly skilled, experienced, and dedicated to creating your dream closet or solving your storage issue. We promise a stress-free experience creating your custom closet by offering complimentary in-home consultations with our knowledgeable designers, and a 3-D preview of your closet, colour, and finish! Our goal at STOR-X® is to provide versatile, economical, and custom-fit storage for home improvement and new building construction alike. We would love to discuss your closet and storage needs and come up with a plan that works for you. Please feel free to book a free consultation today and we can begin making your storage dreams a reality. Custom Closets Organization and Storage Solutions. 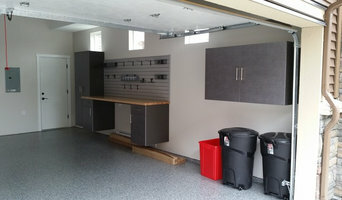 Complete Garage Makeover with Garage Flooring, Garage Storage Cabinets, Specialty Wall Organization System. Best of Houzz 4 years in a row! With over 20 years of service to the greater Vancouver area, California Closets Vancouver has made a lasting impact on how people stay organized inside the home. In fact, we were the first California Closets franchise to open outside the United States! Our team of highly talented and skilled individuals brings a wealth of different skill sets to our franchise and we are united in our dedication to providing top notch service to Vancouver and the surrounding areas. The STOR-X® Organizing System is a custom built, high quality, modular, wood laminate-based storage system that utilizes European cabinet technology for the maximum flexibility in unlimited applications. STOR-X® Organizing Systems offers over 19 finishes including environmentally friendly options as well as a line of solid wood veneers. Tie racks, belt racks, garment valets and roll-out baskets are just some of our accessories available. Whether building a new home or just remodeling an existing space, STOR-X® has a custom designed solution for your Walk-In or Reach-In Closet, Pantry, Garage, Mudroom, Home Office, Wardrobe or anywhere you want to maximize and organize your space. The STOR-X® Organizing System uses only the highest quality materials and hardware and is individually designed and manufactured to each customer's specifications using custom STOR-X® 3D Software. The system is fully adjustable, has a full line of accessories, and most importantly allows the customer to see a 3D image of their closet before it is installed. Garage Guru offers multiple solutions to help organize your garage. Achieve the garage you’ve dreamed of with the help of our motivated team. Whip your garage into shape with the best garage storage solution on the market. Reclaim your space, even park in your garage again. Now, that is enlightenment! Once you book an appointment with our team of trained storage experts, we’ll show you how our products can unlock your hidden storage potential. Using the latest in design software, we’ll give you a 3D plan of your new garage. Call now to unleash the magic. Who knows, maybe we’ll find a sports car hidden in your garage! We carry a complete line of garage systems: -Monkey Bar Storage System -Challenger Cabinets -Contur Cabinets -Steadyrack Bike Rack -Pro-Slat -Strongrack Overhead Storage To really understand the strength, convenience and beauty that our products bring to your home, visit our NEW SHOWROOM, 103 – 197 Forester Street, North Vancouver. Simply Productive creates organizing systems and solutions that work for you! We love working with designers and contractors to help you clear the clutter before or after a renovation, new home build or any other organizing project you may have. We make your life easy and organized! Call now for your free consultation. We are a family owned business based in Vancouver, BC, building closets, pantries, office units, and entertainment units that are functional, maximize the space, and look beautiful. 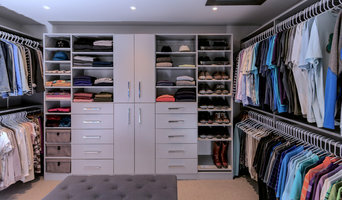 Backed by over 30 years experience working with closet organization systems, Excel Organizers provides design, manufacturing and installation of custom closets for clients in Abbotsford, Langley, Chilliwack and Mission. Located in beautiful Abbotsford, BC, our business has grown tremendously over the years thanks to our residential and commercial customers who appreciate locally made, high quality organizing solutions at competitive prices. From custom closet organizers and accessories, to office organizers, entertainment units and more, we can design and build a solution that works for your space and budget and gets all that messy clutter out of your life. If your home is in disarray or you need to get clutter under control, it may be time to seek help from a Port Coquitlam, BC professional. Professional organizers in Port Coquitlam can help you get almost any space back in shape, whether it’s your office, a master closet, the kids’ playroom or the entire house. Before hiring a professional organizer, consider exactly what you need. Have you just moved into a Port Coquitlam, BC home and have no idea where to put everything? You may want to consider an organizer who specializes in room-by-room space planning or estate organization. Perhaps you’re faced with a tiny closet and an overflowing wardrobe. In that case find a professional who focuses on closets to help you get back on track. Also consider the types of objects that need organization. Are they items like books, family photos, files or collections? You’ll want a professional organizer who has experience designing custom systems with Port Coquitlam, BC companies that will best fit your needs. Find a professional closet and home organizer on Houzz. 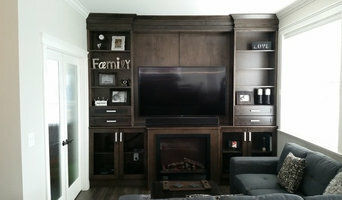 Narrow your search in the Professionals section on Houzz to Port Coquitlam, BC closets and home organization.